Sunday, September 16th at 1:00 PM (following the morning service). 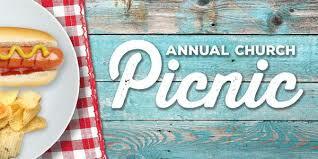 Everyone is welcome to join us for our Annual Church Picnic at Millersville Boro Park located on North George St, Millersville, PA. The church will provide hamburgers, hotdogs and drinks. If you last name begins with A - L, please bring a salad or side dish to share with all. If your last name begins with M - Z, please bring a dessert to share with all.